She’s back! Miss Daisy returns with another tale of exasperation and embarrassment as she reluctantly carries Her Ladyship and her dog Oscar, better known as "The Asthmatic Barking Dog" all the way from Pembrokeshire to John O’Groats before turning south again. Her Ladyship tries to convince her that once they’ve reached John O’Groats, the difficult bit will be over. ‘It’s downhill from then on Old Girl, all the way to Land’s End.’ Miss Daisy is not convinced. If the next ten days are going to be anything like her previous experiences, then she may as well go and get herself a one way ticket to the scrap yard. It’s a tale of two ends – well three actually, as Miss Daisy recounts her experiences day by day, each getting worse than the one before. Why can’t a simple daily 200 miles be trouble free? The ebullient Her Ladyship relishes every mile, negotiating her way through hitchhikers, a gentleman who appears to die on them as they arrive in Welshpool, a young Scotsman who convinces her that a haggis is every bit as good as a passport when it comes to travelling safely through Scotland and a Russian spy whose Borzoi takes an unhealthy interest in The Asthmatic Barking Dog and he’s not the only dog to do so. Adventures abound, often involving the haggis as Miss Daisy and Her Ladyship... oh yes, and The Asthmatic Barking Dog lurch from one disaster to the next. 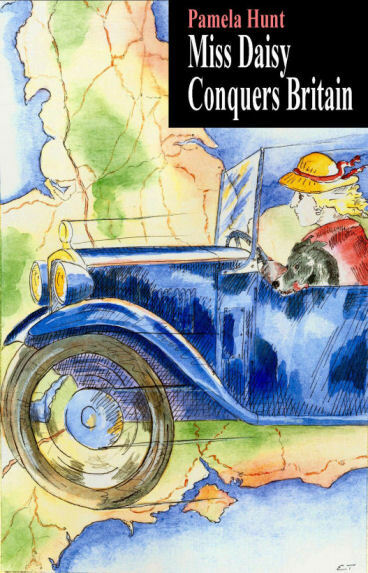 “Miss Daisy conquers Britain” is an entertaining book that perhaps could be kept in the toilet as an aid for the relief of constipation. It will never fail to raise a chuckle and more often it will generate a good belly laugh, as in her inimitable way, Miss Daisy tells her story. Not often do you come across a book that is both entertaining and engaging from the off. that this book is written enables you to create each scene vividly in your mind, bringing colourful characters to life. as they make their way to John O'Groats and then back to Lands End. oh and you may as well throw in the dog as well. What an absolute Joy. Sadly, Oscar The Asthmatic Barking Dog, so called because his bark sounded as though he had asthma, passed away on 30th July 2013.